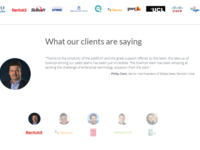 Since our platform is extremely industry agnostic, we can support any organisations where there is a need or want for launching highly successful social selling programmes to impact revenue. 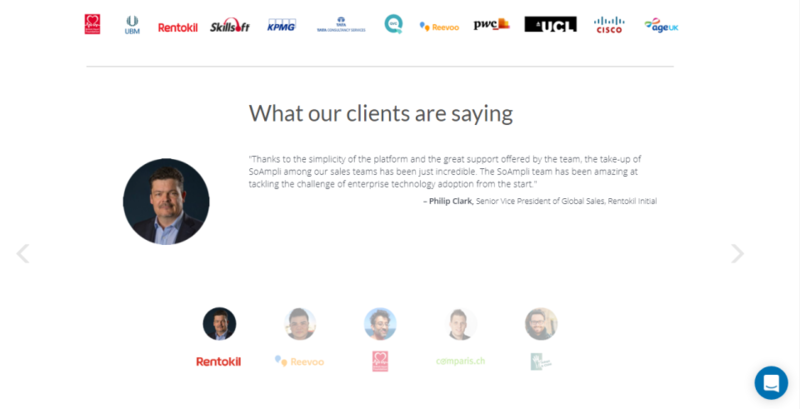 SoAmpli is an award-winning advocate marketing and sales SaaS platform. 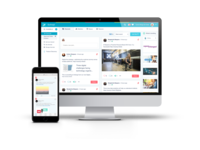 Through a beautiful and user-friendly interface, SoAmpli helps companies turn their sales team into social selling stars increasing sales and powering brands. The SoAmpli platform facilitates the creation of a centralised space for heads of marketing and social media managers to quickly distribute fully-approved, 100% on-brand content to their sales team and employees. 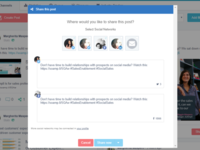 Pros: Amazing interface, which allows easy ability to integrate your personal and company social media accounts. Then simply create new posts and/or interface your feeds or others to allow you to then schedule all the posts you want and personalise them. 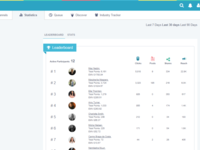 Also you can track and monitor your competitors and peers to see what and how successful their posts are. And finally the solution allows for a bit of internal competition in your organisation to see who is posting the best quality social media items. Cons: Not much really....only minor things which with a relatively new player on the market, that is a SaaS platform, they are adding new functionality all the time. They take pride and really offer a great customer experience by wanting to know all the possible new features you would be interested in. One of those I would like is the ability to replicate an old post......then edit and be able to resend it out. Overall: ability to rapidly increase our personal and company social media presence. Pros: SoAmpli it's extremely simple to use, it takes me less than 30 min to on-board a new user and support/account management is amazing. Cons: Maybe one thing could be that there is no Android app yet, but it's not an issue as I mostly use it on desktop. Pros: SoAmpli is simple and easy to use. The automation process makes using SoAmpli a breeze. Cons: Since I started using SoAmpli it continues to evolve and grow so at this time I would not change anything. Keep providing the strong content. Cons: Really trivial things that I don; like. Can be a little difficult to find your posts once amped, but not shared yet, in among the deluge of other posts from other members of the team. Tagging posts can be a bit of a performance, because on a mac, the tag list drops off the screen. But like I say, trivial things - truly - and massively outweighed by the advantages. Pros: The platform is great for promoting content to both internal as well as external audiences, facilitating day-to-day brand advocacy with much ease. Overall: Daily social amplification and publicising for the brand that I work for. The platform is continuing to evolve with the times and is open to feedback from clients to help meet our requirements as much as possible. Pros: Schedules of posts are my fav, means you can sort everything in a few minutes at the beginning of the week and talior which platforms with which posts to get the farthest reach, spreading the communication. Cons: Don't have much but having access to Instagram and snap chat function would be good to add to media platform. 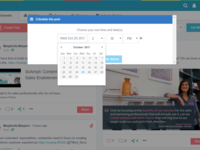 Pros: Sharing and scheduling the post's in to different social media platforms with one click is really awesome. The different channels available are good source of information. All these makes everything easy and can promote the message/post everywhere at your own convenient time. Overall: It's awesome! I would highly recommend SoAmpli! Pros: The tool is practical and very easy to use. It is interesting to post also articles which don't have directly something to do with what the company does, like news about the society or political decisions. I like also the possibility to personalize the own channels and to have a look into the statistics. Pros: I like to get the notifications there are posts to share and the system is easy to set up and use. Cons: I cannot post to the charity facebook page direct - have to post to my page and share. A few times it has 'lost' the facebook page and not all the icons on your settings page display on my laptop, so it feels difficult to re-instate. Also don't want to see other local Age UK posts that are only relevant to their area. Pros: I usually schedule my posts every quarter. I schedule 2x a week (mon/fri) for 2-3 months at a time. Love that I can do this and stay noticed. Cons: I haven't found anything that I dislike thus far.The product allows me to do what I need with ease, and because of my companies involvement I am able to search through posts, and queue relevant info to what I focus on. Overall: Staying relevant and active in the online business world.